The Thermo Scientific TruScan analyzer is a rugged, handheld, lightweight Raman system for rapid raw material verification. The Thermo Scientific TruScan analyzer is a rugged, handheld, lightweight Raman system for rapid raw material verification. Non-destructive point-and-shoot operation enables verification through sealed packaging to minimize risk of exposure and contamination. 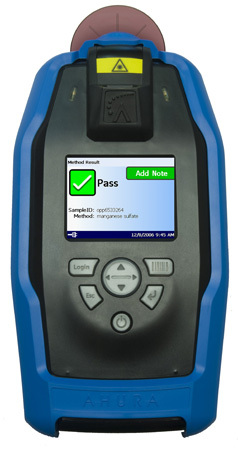 Its embedded analysis software delivers a PASS/FAIL decision verifying the identity of a sample within seconds.